Make Money on Google Adsense? …so much so that that you’ve probably been creeped out by them at times. No, I’m not talking about your spouse’s co-workers, I’m talking about Facebook ads. So how do these ads know so much about you? Well, that gets to the heart of what makes Facebook ads such an intriguing marketing opportunity. See, Facebook advertisers can target you by the information you put in your profile like gender, age, college, marital status, favorite books/movies/TV shows, pages you’ve Liked on Facebook, etc. (I’ve even seen tests recently where ads are targeted based on words you type in your Status Updates). This is quite different from other online paid advertising programs such as Google AdWords. With AdWords you target people by what they want and are actively looking for (based on the search queries they type into Google). On Facebook you’re targeting them by who they are. And you’re doing this using arguably the most complete and accurate set of demographic information available to marketers. One is not better than the other. They’re just different ways of reaching your target market. Which is better for your business depends largely on who your prospects are. If you’re a DUI attorney, no one on Facebook is Liking pages that say “Hey, I like to drive drunk.” You’re better off targeting people typing “DUI attorney” on Google because they’re actively looking for you at the moment they have a serious problem you can help them with. On the other hand, if your prospects are accountants, it may be very difficult to find keywords that only accountants are typing into AdWords. Targeting people by profession and/or college degree in Facebook is likely a much better way to reach your prospects. Before we get into the nitty gritty of converting on Facebook, it’s important to understand what makes it such an intriguing opportunity right now. There are a few big market forces in motion that make it a great time to jump on board the Facebook paid advertising train. The Undisputed King of Social Media – Facebook has passed the 800 million user mark. Half of whom log in every day, visit an average of 5 pages and spend an average of 23 minutes on the site PER VISIT. Your prospects are on Facebook and they’re spending a lot of time there. No other site can match numbers like these. Facebook’s impending IPO – Facebook is expected to go public early next year. The thing with public companies is they have to make money (and a lot of it) to keep investors and analysts happy. Advertising is the major source of revenue for Facebook (as it is for Google) and they need to make their paid advertising program even more attractive to advertisers to boost their revenue and profitability. (Relatively) low click costs – They’re on the rise, but clicks can still be had on Facebook for well under $1 and even CPMs (cost per 1000 impressions) can be had for under $1 as well. While there are plenty of reasons to love Facebook paid advertising, there’s plenty of frustration waiting for you if you do. Facebook is still trying to figure out this whole paid advertising thing and, hopefully, may of these issues will be fixed sooner rather than later. However, the frustrations caused by these issues, and others, also offer an opportunity. A lot of people give up because they think Facebook paid advertising doesn’t work. That gives those who stick with it a definite advantage over their more easily frustrated competitors. What does it take to run a successful campaign on Facebook? Step one is getting someone to click on your ads. Unlike AdWords, where ad copy rules, when it comes to Facebook, the image you choose has the biggest impact on whether you get the click or not. Remember: people aren’t on Facebook to look at ads. They’re on Facebook because they want to see what their “friends” are up to, to kill time, and/or to find, and connect with, interesting people/groups/etc. This first ad uses a few great tricks to grab attention – using a cute, crying toddler, having text in the image of the ad and using a red border. Any one of those strategies is good, using them together is great. 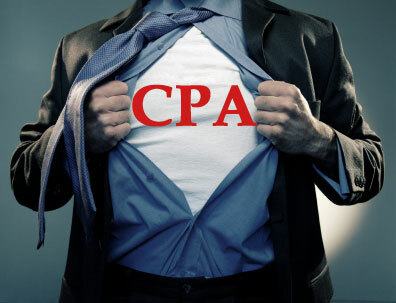 I used this next image in an ad campaign targeting CPAs. It ran successfully for about 3-4 months (which is a long run for a Facebook ad). Using big, red letters that specifically called out my target audience and positioned them as a hero (which tied in to the messaging of the overall campaign) was very appealing to accountants. This one is fairly obvious…using a smiling, attractive woman in an ad works just about anywhere (just be careful because Facebook says the image you use has to be related to your business, which doesn’t appear to be the case here). Lastly, you can use the power of social proof in your ads by running ads targeted to Friends of people who Like your Facebook page. This ad shows me that some people I’m connected to on Facebook Like HubSpot and displays an image of one of them. This really plays into the social nature of Facebook and is a great way to get the click. Another key to a successful Facebook campaign is smartly targeting your prospects. As a marketer, Facebook’s 800 milliion users don’t mean much. So what numbers are important? 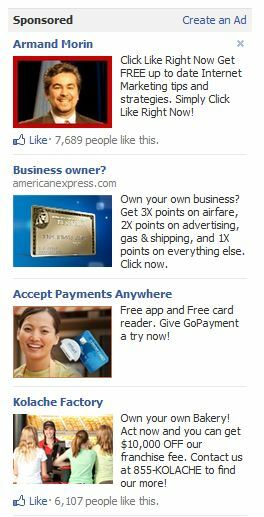 And here’s the beauty of Facebook advertising. You can break things down even further. That bar owner in Boston can run ads mentioning specials for Harvard students just to those who attend Harvard or “BU Night” only to those who go to Boston University. They can even run ads targeting students from all the local schools who are Engineering majors. In general, the more specific you are in your targeting, the more specifically your ads speak to target audience, the more likely you are to get the click. But getting the click is just the first part of the equation. The second, and more important part, is how to turn those clicks into business. And that’s exactly what you’ll learn how to do in next month’s post! Make sure you don’t miss it by subscribing to The Daily Egg! About the Author: Adam Kreitman owns Words That Click, a St. Louis internet marketing firm focusing on SEM for small businesses. He is aGoogle AdWords Qualified Individual and would love to have a conversation with you about Facebook Advertising. How to Start Rich Media Mobile Advertising? Top Ways Of Earning Money – Online jobs In 2017! What is Social Media Marketing ? How to make Money with Amazon.com ? Hi I want to start earning through facebook. How to start this. how to ern money from facebook please trained me also..
Hi.. How to start this woks…… please urgent inform me. i am interested for erning through facebook. I M too waiting to start online earning works, please guide me if get any such information..
H! I’m interested. How to start? i wanna do dis job…. try to join me in this. . . .
Hey plz tell me hw do I strt ….mail me.. Please Mail me the details. I want to this job. Plz inform me thank u.
Hi I want to start earning through facebook. How to start this.Mail me the details.Thankyou. I want to do this job pls tell the all details ??? I really want to earn some extra bucks through Facebook, so please mail me all necessary details. I want this job .kindly tell me all details. I have interest to do the work and earn money with social media like facebook. Pls help me to do that..mail me the details and guide me. Thank you. how I start this job? I want to earn from facebook how can I do it. Plz let me know how to start..
Plz reply me and Send me details. Ive in no way read something like this prior to. So nice to find somebody with some original thoughts on this subject, really thank you for starting this up. this web site is some thing which is necessary on the web, an individual having a little originality. valuable job for bringing one thing new towards the web! I am also earn money. so can i…? Hello sir i am interested to earn money through facebook. Please mail me the Tips. I want to start earning by Facebook, call me or email me. But I don’t have website how to get it give idea. Really iwant job facebook or anyone exetra…..
pl let me know how to start facebook earning job. Please inform me how can i start this work? sir i too want to know how to earn through facebook so please help me cope up with this.sir pls e-mail all the details. How I can start earning through Facebook can u plz mail me the details for the same. Hi , im Interested to Earn Money , Kindly Mail me Details …..
i want to join this.. I want to do this job. I am interested how can I start earning ? Not understand how can start the business. Please email me all the details like how to start and all kinda stuff!! can you plz help out to start advertising in FB. How I can start earning through facebook can you pls mail me the details for the same. Please paste the job opportunity through my email. I want this online job , so please tell me how can i do this ? I want to do this facebook job. Please send step by step process to start this job. How to make money in facebook? I want to so this job……. Plz reply me and e- mail me all the details..
3 Easiest Tips to Make Money Online Very Fast – Legally !! Best 5 Online Money Making Tips – Must Try! How to Make Money With ClickBank? How To Make Money On EBay? How to Make Money with Email Marketing ? How to make Money on Youtube Videos? Make Money With Social Networking Sites! Top 10 Reasons for getting banned from Adsense! What you Should and Shouldn’t Do for SEO for HIGH PRIORITY?